Flavorful and filling dishes are really what we aspire to when we’re thinking of our meals, and any short cuts we can find to help minimize the work, we welcome with open arms. 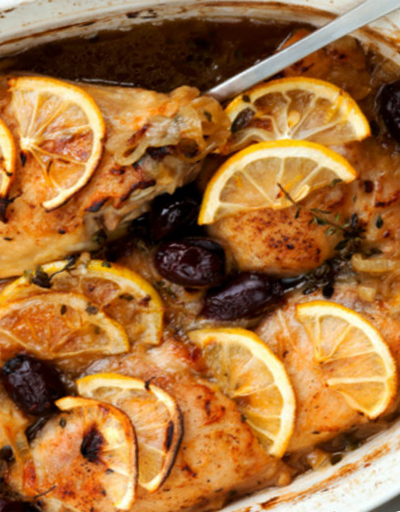 Full of garlic, lemons, olives and onion, this meal packs a serious punch and you can set it up and then check out for a few hours while the cooker works its magic. This dish is the perfect choice for any dinner (or lunch the next day), due to the tender, juicy chicken we get after several hours spent in the slow cooker, and we know you’ll love it! Season chicken pieces evenly with salt and pepper and oregano, and heat 1 tablespoon olive oil in a large pan or skilled over medium-high heat. Once oil is hot, but not smoking, add chicken (in batches) to the pan to brown on both sides. About 3 minutes per side. Pour in another 1 tablespoon olive oil and brown remaining chicken. Set aside. Transfer chicken and juices to slow cooker and add garlic, onion, olives, chicken broth, water, the juice of 1 lemon and rosemary. Slice remaining lemon into thin slices and spread out over chicken pieces. Cover and cook on low for 5-6 hours, or until chicken is completely cooked through. Optional: transfer chicken to serving platter and pour cooking liquids into a medium saucepan over medium-high heat. A little at a time, add 1-2 tablespoons flour and 1-2 tablespoons butter to thicken the liquids and create a gravy-like sauce for the chicken.